Features include smooth and silent operation, excellent side stability via its captive roller technology, self closing action and special rear mounting systems for face frame construction (optional). 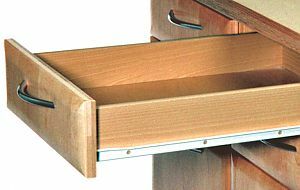 The epoxy coated white color adds a tasteful touch to any drawer. Interchangeable in the 32mm system. Simply put, this slide is quality in motion. Note: This product is also known as MEP-1702WH22, MEP-1702.550.2, MEP-1702-550-2, F080074001213 on other websites. Warranty: Lifetime quality guarantee. Screws sold separately. 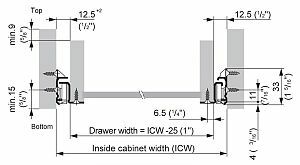 Recommended Use: Heavy-duty slide designed for kitchen cabinets, bathroom vanities, desks and furniture. Screws and Instructions are not included. Mounting: Side-mounted. Screw fastens from either bottom or side. Clearance: 1/2in. (12.5mm) - inside of cabinet to inside of drawer. Features: Smooth and silent operation, excellent side stability. Self-closing action and special rear mounting systems for face frame construction (optional).